Agave americana, a variegated century plant, makes a bold statement in any landscape situation; from Mediterranean style or xeriscape. White-striped agave can be planted in the sunny landscape in groupings, as individual specimens or as large container plants. 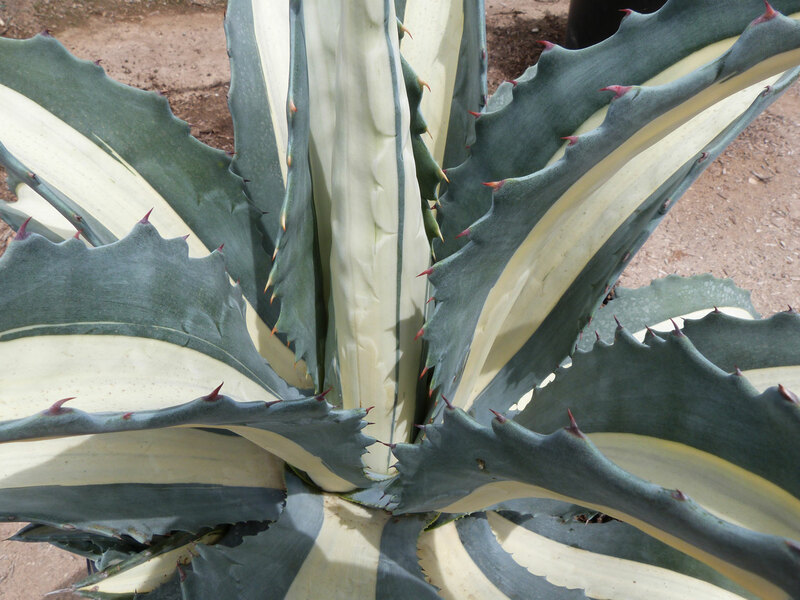 This agave has a very modern and sculptural appearance with sword-like leaves that are only slightly recurved. The blue-green leaves have a cream colored stripe down the center that makes the plant “pop” from a distance. The sharp spines on this agave are recurved and each leaf has a spine on its terminal; use caution when planting and pruning and make sure plants have adequate clearance from public walkways or other high-traffic areas. This agave is very drought and heat tolerant but is only cold-hardy to about 15 F degrees. In colder climates, pull container specimens indoors during winter. White-striped agave prefers soil with good drainage in order to thrive and performs best when allowed to dry between waterings. Yellow to greenish flowers appear at about 10 years of age and attract hummingbirds and other pollinators. Like other agaves, this monocarpic plant dies after flowering. Plants will produce pups around the base of the original plant to replace it once flowering is finished.